The technique healed fractures after a single dose. Fixing broken limb bones after serious injuries can challenge even the most skilled orthopedic surgeons. Too much bone loss makes regrowth impossible, and even smaller fractures make bone growth problematic if the patient is in poor health or at an advanced age. When physicians encounter these kinds of nonhealing fractures, autologous bone grafts are the gold standard for treatment. These bone grafts involve harvesting a segment of healthy bone, typically from the pelvis of the patient, which is then used to “bridge” the portion of the break that isn’t growing new bone adequately. However, bone grafts are not always possible, depending on the patient’s health and the extent of the damage from the break. Some doctors in recent years have started to try something new: incorporating bone morphogenetic proteins (BMPs) into bone implants to enhance healing. This isn’t a sure thing, though. Through their traditional administration, BMPs come with significant side effects including bone formation in soft tissues and bone resorption. These side effects might have occurred because BMPs were administered in large doses, so researchers came up with a new strategy: use gene therapy to deliver not the protein itself, but the underlying gene instead. This way the cells will get BMP at physiological levels solely at the site of the injury. However, getting gene therapies into the right cells isn’t always easy. The genes are typically delivered using viral vectors, and these come with their own safety concerns. The researchers in this case used a relatively new delivery mechanism instead: sonoporation. In sonoporation, an ultrasound is used to cause gas-filled microbubbles with lipid shells to oscillate and create tiny, easily repaired holes in cells. These tiny holes allow DNA for gene therapy to enter into the right place without affecting other areas. The next step was ensuring that the gene therapy targeted the correct cells. The team targeted a special form of stem cells that can become bone cells and produce BMPs proficiently. The researchers trialled their new strategy in broken pig shinbones and found that the technique healed fractures after a single dose. They first inserted collagen scaffolds, because they attract the stem cells, and then waited for two weeks to allow the scaffolds to recruit sufficient numbers of stem cells. Next, they injected a mix of microbubbles and BMP-encoding DNA at the fracture site, and applied an ultrasound pulse. The team then waited for eight weeks after the single instance of the gene therapy. The experimental fractures were healed, while the control animals’ fractures were not. This innovative therapy could improve the recovery of millions of people around the world. 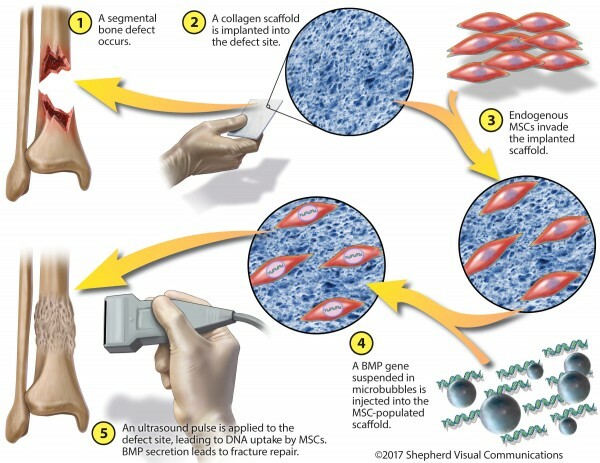 While human trials must be conducted before we know whether hospitals should adopt the procedure, many of its components have shown enough promise for scientists to utilize them in similar bone-healing experiments: One fracture-fixing strategy incorporates a specific form of BPM, and another therapy uses stem cells to revitalize bone growth.